1. 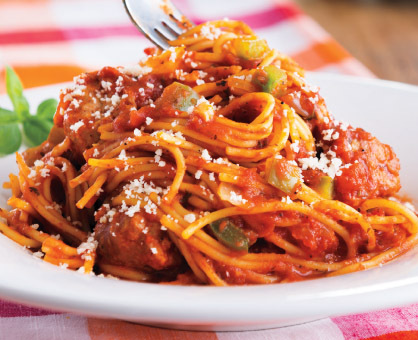 In 5- to 6-quart slow cooker bowl, combine all ingredients except spaghetti, water and cheese. Cover slow cooker with lid and cook on low 6 to 7 hours or on high 3-1/2 hours. 2. Add spaghetti and water; stir to combine making sure spaghetti is completely submerged in liquid. Cover and cook on high 40 to 45 minutes longer or until spaghetti is tender. Serve with cheese.